Events are a great marketing tool. They offer a unique opportunity to showcase your business and personality, educate customers and engage with them on a different level. However, in a busy world, it’s a big ask to convince a delegate to invest not only financially but to take time out from the day job, so positioning your event correctly in the marketplace and communicating why this is a ‘not-to-be-missed’ opportunity is essential. 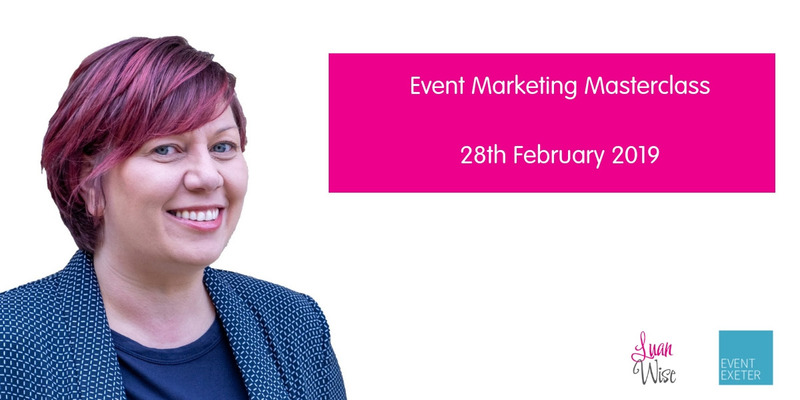 Event Exeter are offering you the chance to attend a free interactive Event Marketing Masterclass, run by Luan Wise, Chartered Marketer and fellow of the Chartered Institute of Marketing (FCIM), with more than 15 years’ experience in agency, client-side and consultancy roles. Luan will bring to life her online Event Marketing course that has now been watched by over 10,000 subscribers to Lynda.com, LinkedIn’s online learning platform. Who: This event is suitable for event planners, event organisers, marketing managers and executives. Attendees will take away a series of event marketing checklists and a 30-day free subscription to watch the course on LinkedIn Learning. Luan was recognised as one of the top five female marketers in the UK for the #LinkedInBestConnected social campaign in 2015. She was subsequently invited to audition as a course instructor for LinkedIn’s online learning platform and has produced seven courses to date, viewed more than 300,000 times. She is also an accredited trainer for Facebook's #shemeansbusiness campaign with Enterprise Nation. She is author of the award-winning book ‘Relax! It’s Only Social Media’ and creator of the ‘Social Media Planner’, listed by the Independent as one of the ‘9 best books for entrepreneurs’. Travel: How to get to and around the University of Exeter.